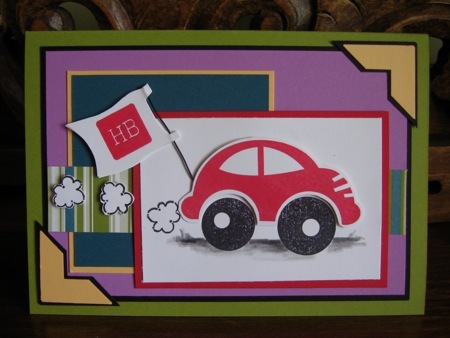 Cards For Kids - Ideas By Ann Craig Using Stampin' Up! Products. Creating cards for kids is lots of fun. You can choose themes that relate to many different topics, like pirates, princesses, cars, boats, animals and so on. Stampin' Up! 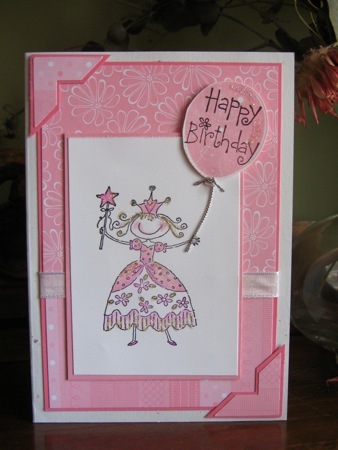 has a wonderful array of stamp sets that help you create this type of card with ease and creativity. 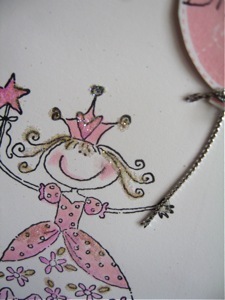 Stamp sets like Pretty princess (page 38 of the Idea Book & Catalogue), Boatloads of Love and Loads of Love (pages. 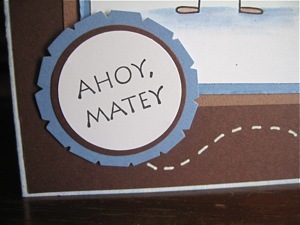 44, 45) Ahoy Matey, By Land) (pages 62 and 63) and Wild About You (page 66) to name just a few. The following examples show you how to create some unique cards for kids by using BLENDER PENS and CLASSIC INK PADS. I've done a card suitable for a girl and a couple of different ideas for a boy. The pirate card uses a variety of products and techniques. 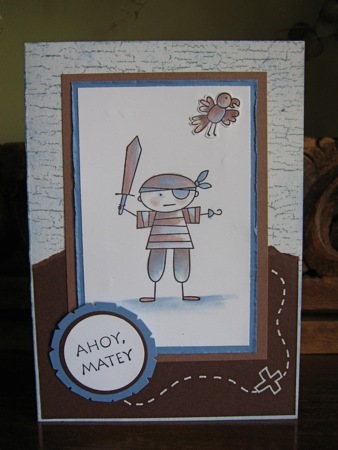 Products are: Stamps -Ahoy Matey, Weathered Background stamp. Accessories: Punches: Scallop Circle, 3.5 cm circle, 3.2 cm circle. Blender Pens, White Gel Pen, Sponges and adhesive. It is usually easier to print and colour your images onto either the Whisper White or Very Vanilla card stock as it is produced especially for this purpose and has a really smooth surface that accepts the ink very well. It just goes to show you that you can do almost anything with Cards for Kids. The next card is also for little boys, although I can see great possibilities for pre- teen girls with this one too. Just a change of colour to maybe a bright pink or yellow car, a flower on top of the aerial and the transformation would be complete. You could try this - if you do, I'd love to see it. Here is a card for the girls and of course it is pink! Actually I made another one to the same card sketch using lots of brighter colours, but I gave it to my Cards for Kids workshop hostess on the weekend. I've used Designer Series Double Sided Papers from the Petals and Paisleys and Spring Fling packs for the background. This is a quick and super easy way to get all sorts of colourful, patterned, co-ordinating backgrounds on all your cards, but especially when you're creating cards for kids. The colours and patterns are wonderful and offer so many different combinations that you may even find it hard to choose!. Ink: Pretty in Pink, Pixie Pink and Basic Black. Card Stock: Whisper White, Confetti White, Pretty in Pink and Pixie Pink. Accessories: Photo Corner Punch, Blender Pens, 2-way Glue Pen, Stamp-A-Ma-Jig, Dazzling Diamonds Glitter, White Tafetta Ribbon, Stampin' Dimensionals and Snail Adhesive. The technique used is Colouring with Blender Pens and Classic Inks. It's a little hard to see the glitter on the card in this photo so here is a close-up. I didn't put any colour on the hair, just the glue and Dazzling Diamonds, and then I picked out highlight areas for more glittering. HINT Use the corner of the tip of the glue pen for narrow areas or lines, otherwise the glitter can be overwhelming and spoil the shapes you're wanting to highlight. Also be aware that the colour, being water-based, may be affected if you overdo the glue application. If you would like further information on or instruction about any of these cards, please feel free to contact me. Why not place an order for the Stampin' Up! products to make these cards? You will get hours of enjoyment as you try using a variety of techniques and card sketches to produce your own hand stamped cards and scrap pages. View the catalogues on-line then contact me on the form above to order your goodies. You can view other examples of Cards for Kids that use many different rubber stamping techniques. You'll also find examples scattered through the various pages of this web site, so browse away and follow the links. There is lots to see and learn.